Dont miss the first two issues of a blood-soaked 6-part miniseries drawing together three of horrors greatest characters! 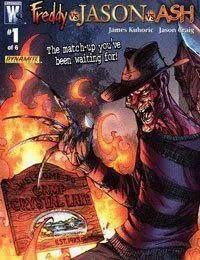 In the bloody wake of the hit movie Freddy vs. Jason, Freddy Krueger finds himself clinging to the last shred of fear that allows him to exist…inside the demented mind of Jason Voorhees. Unwillingly bonded together, the murderous pair must seek out the Necronomicon, the only solution to their mutual torment. Nothing can stop this unholy alliance -- except the wisecracking, chainsaw-wielding Ash, aimed at destroying the Book of the Dead once and for all!